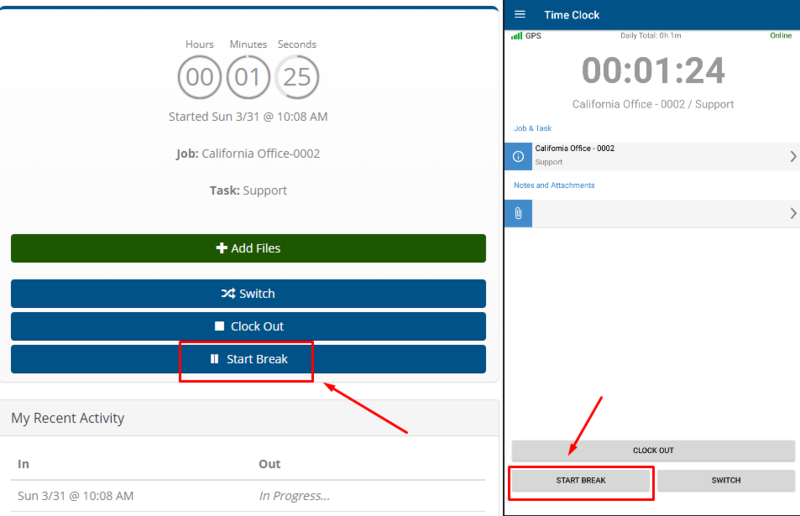 The easiest way for employees to clock out for lunch is by using the "Start Break" button in the mobile app or on the My Time Clock page of the website. These buttons start a new timer for the employee's lunch, which will be deducted from their time for the day in your dashboard. The lunch break will also be specifically marked as a lunch break in the dashboard. This makes it easy to keep historical records for compliance purposes, as well as to quickly look at an employee's day to make sure they took a lunch. Lunch breaks may also be added manually by an administrator via the dashboard. Employees can also clock out to take lunch and clock in when they come back, but using the Lunch and Break buttons require fewer steps because the job and task are already selected. GPS tracking is suspended while employees are on lunch or break, so if you use the GPSTrak™ feature you will not see any data during these periods. Lunch breaks can also be automatically added to time records. Read more about automatic lunch deductions here.